Our commitment to safety is evident in every aspect of our operations. We start with ensuring the safety of the design of our State of the Art equipment which is built with the help of our team members. Operating safely will always be one of the company’s primary objectives. Supported by Standard Work Procedures, our experienced team of supervisors and technicians are repeatedly achieving high levels of professionalism and competency. The commitment of every team member at Vincent Communication and Controls Ltd. is second to none. 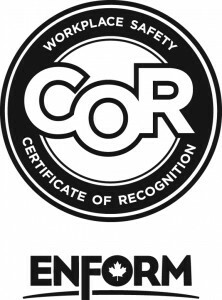 We have achieved a Small Employer Certificate of Recognition (SECOR) in both Alberta and British Columbia, thanks to the outstanding contribution and commitment to Health and Safety by our team. We are members of the vendor safety management and compliance systems ISNetworld and ComplyWorks. Contact us for more information on our safety program or for vendor qualifications inquiries.